Did anyone else get flashbacks to the Xbox One launch with World of Warcraft‘s flying announcement? I pictured a lot of arm-folding and sulking as it was being delivered. “All right, I guess we’ll do what you guys say you want, but we were still totally right to say you didn’t want it.” Maybe it’s just me. The point is that players have finally sort of been listened to about an issue that’s been getting serious blowback since the expansion launch. Pretty much everyone expects that this year’s BlizzCon will feature another expansion announcement for the game, of course, which makes the development team’s attitude particularly relevant. I can tell a convincing story in which this year’s expansion is an actual return to form; I can also tell a story in which it’s a pretty major misstep again. So let’s look at what could come next for the game, from the really good to the really, really bad. Failure can be a good thing. Trying to do something and finding that it genuinely doesn’t work can be a simultaneous wake-up call and a chance to step back and re-examine what you’re doing. And it’s very possible that the development team has been listening to all of the feedback about this expansion and is making a big sea change for the next. While I’m not exactly a fan of how every new expansion is treated as a way to wipe the slate clean from the immediately preceding expansion, it does have the advantage of leaving the bad behind. More to the point, if the next expansion does go in a new direction, it could explain the reticence of the development team; this is the ultimate expression of what the game used to be, and now the developers are going elsewhere. Rather than climbing to ever-greater heights, the new expansion could offer a more horizontal path, a revitalization of elements that have been in the game for some time. Imagine an expansion that touched upon and expanded all of the extant parts of the game world, not just a new continent and not the sweeping overhaul that Cataclysm provided: a new form of progression not tied to climbing up a level ladder once more, and gear changes that didn’t just mean a new tier that invalidated everything you’ve had before. I think the odds are low, but boy, wouldn’t it be wonderful? Realistically, I think that the next expansion will bump us up another 10 levels and introduce another new continent to conquer. I do not have much hope that will change. I do, however, have hope that the feedback about this expansion will actually be taken into account when designing the next expansion. I mentioned a lot of issues in the last installment of this column, and literally every single one is something you can find elsewhere. As it stands, the developers have created an environment that feels more closed-off and less flush with options than ever before, even though that’s not objectively the case. I’m not going to spend another column explaining that in depth; the point is that it’s not something that has to be the state of the game going forward. While it’s not my dream scenario, I would be happy with an expansion that backs off of the developer’s current fascination with cramming people into content they don’t want to do. It’s something that will need to be done in an iterative fashion, yes; as many of you have probably noticed, I don’t belong to the school of thought that says you can just roll back bad changes as if they never happened. The mess that is bonus rolls over points needs to be addressed. Lack of small-group content and dailies needs to be addressed (and is, in part, in 6.2). All of this stuff needs to be changed, and if the next expansion just says “surprise, we’re remaking the endgame from the end of Wrath of the Lich King‘s life cycle,” I won’t consider that a positive move. But I do see the possibility that after years of players waxing nostalgic for that time in the game’s life, we might actually start moving back in that direction. I sort of have nightmares about this. I mean, the bulk of the nightmare is usually about fighting off hordes of cyborg insects while all of my teeth fall out, but in the background there’s something about how the next expansion is basically the same as this one, only with flying in from launch and yet another unrewarding difficulty level for dungeons. This is what I would consider an outright bad version of the game’s future. What the game needs is a pretty significant set of changes; it’s all too easy to get what amounts to the same philosophy with only minor elements addressed. That’s also why I’m particularly worried that the developers might not have understood the whole flying discussion, which wasn’t simply about flying as a mechanic but had a lot to do with flying as something which players enjoyed that got removed more or less for arbitrary reasons. A major element of gameplay was yanked because the designers didn’t like how it played, chiefly due to the fact that only one-and-a-half expansions have ever designed around its existence. It’s here that stuff like looking at a three million subscriber drop and saying “well, that’s to be expected” really worries me because it’s not to be expected. Instead of ascribing motivation to independent events, that’s implying that human beings behave as predictable natural phenomena. Assuming that players will arrive or depart completely independent of your design decisions is not a good place to be. What really freaks me out is the undercurrent that runs through interviews and developer statements every so often, that the powers that be are looking at numbers and seeing weird results. That they look at the numbers and see “more people are taking part in non-LFR raiding than ever before” rather than seeing that the number is as high as it is because no real alternatives are presented. Oh, sure, there’s no way that a developer can come out and say “we screwed up majorly,” although it would be heartening to see. But it’s hard to tell the difference between someone spinning something negative in a positive fashion and someone who genuinely believes that Warlords of Draenor has been a successful expansion. Yes, I still love the game. But as I’ve said elsewhere, at this point it sometimes feel as if I love the game in spite of itself, and it does its level best to erode my affection with each update. Among the most positive die-hard Blizzard fans I know, the attitude is one of caution and resignation. There’s a serious sense that all is not well in the game, and this expansion has managed to demolish much of what kept people playing. If you’re not interested in organized raiding or serious PvP, the game is sending the message that it doesn’t want you around. 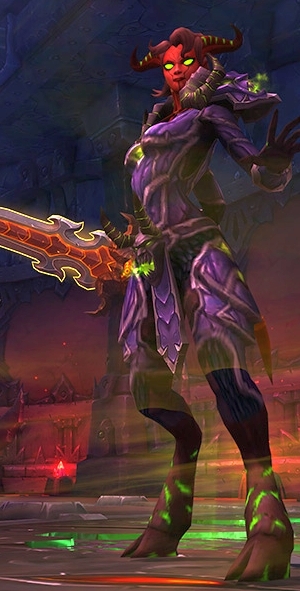 That’s the real fear, I think: that anyone at Blizzard could look at an expansion that effectively destroyed Heroic dungeons, crafting, dailies, and much of the socialization of the game, and call it a win. Feedback, as always, is welcome down below or by mail to eliot@massivelyop.com. You can feel free to leave your own speculation down below, as well. Next time around, unless we have another explosion of news, I want to chat about what horizontal progress could even look like in WoW. Outland back in TBC had an area with flying dragons that would attack you and make you fall to your death, and land based anti-aircraft cannons. And you know what? The first time my character got shot out of the sky I /giggled/. Pity these ideas didn’t leak into the rest of the game design. Agreed. Blizzard should have just made Garrisons a separate mobile game on Android, iOS and Windows phone. They would have made a killing too. I shuddered when I heard about Garrisons, it’s a distillation of just the sorts of things I *don’t* want in MMOs! I quit because of the talent changes back in the cataclysm precursor patch removed user agency and the ability to make creative builds in one swift stroke. Had things remained ‘more of the same, but better’ moving forward from Wrath, I’d probably still be playing, and my IRL friends would be as well. While that’s all water under the bridge at this point, I still enjoy learning about game development, and blizzard is still relevant to this. Ya, not being able to fly in draenor wasn’t even a blip on my radar for reasons I stopped playing…. again. muneravenmn MaxSand I guess, but I see a lot of them that still stay, still grinding rep, still leveling alts, still fishing. I also think they are the majority of subs. I agree, as i said in the OP, there is no WoD content for them outside of apexis crystal dailies which I am fairly sure everyone hates, but I see lots of people doing that same old “other” stuff. Agreed with most of what the OP said. I liked WoD at first, the leveling was nice despite how much I hate phasing and instancing and how common it was. But garrisons… omg. In my WoW career I’ve never once thought “Oh man I can’t wait for a new xpac cause I hate Org/Shatt/Dalaran.” But I can’t WAIT for garrisons to become outdated and no longer relevant content. Garrisons alone sucked the life out of the game for me. The destruction of dailies, the obliteration of crafting and walling off everyone in their own personal instance was T H E W O R S T I D E A E V E R.
Bring on a new expansion, because I’m done with WoD. This was a great and thoughtful piece. Thanks. strangesands That would be brilliant. Sadly, I would not be surprised if we ended up with a new continent xpac like ‘the southseas’ focused on Azshara and the Naga or something. I would love to see Azeroth introduced again with all-new content targeted at high level characters. Return to Azeroth from Draenor and find it similar but new problems arising in the old zones. Basically give us back the entire world, but overlay it with completely new quests, dungeons and content. It would fulfill both our nostalgia, give us reasons to go back to old places, but also provide subtly new experience. Overlay Azeroth with a post-100 map. I’m not saying shift the world ala Cataclysm, but use instancing to provide quest paths into the corners of the world we have not seen in awhile. Timewalking becomes a shift between pre-100 and post-100.